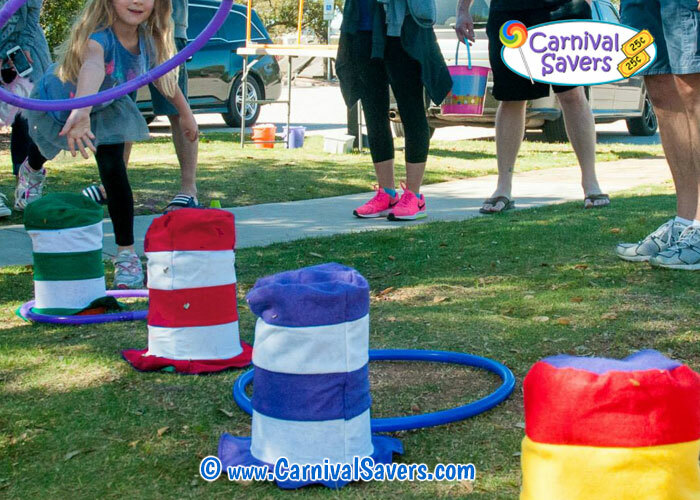 Crazy Hats Game - Perfect for School Carnivals! Hats Need the Water Jugs to prevent Tipping. Small Hula Hoops Work Best for this Game. Preparation for this game is simple. First you place your water jugs about 2 and 1/2 - 3 feet apart in a straight line behind your designated "stand behind" line area. Next, add the StovePipe Hats on top of each jug of water and your "stand behind" lines and your game is ready to roll! 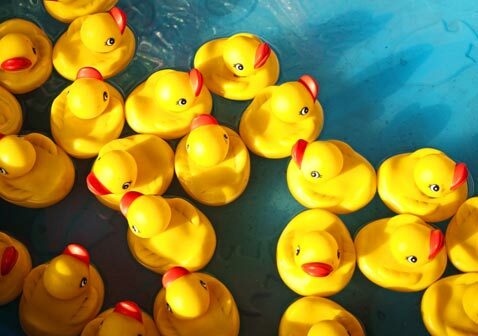 As far as the prizes, each prize coordinates to how many hats are "looped". So mark your prize buckets with "Green/White Striped Hat Prize", "Red/White Striped Hat Prize", "Blue/White Striped Hat Prize", Rainbow Striped Hap Prize". Like all games, we recommend that you have some different "stand behind" lines if you anticipate children of all different ages playing your game. For example, is is ideal to allow preschool children to stand a little closer and/or for older children (like 4th and 5th graders and up) have a line a few feet back. Of course, if this game is for a group of teenagers one line would be fine. The goal of this game is to loop all 4 colorful hats, in order, with the 4 small Hula Hoops. Each player is given 4 hula hoops with the opportunity to "hoop" each hat in order. 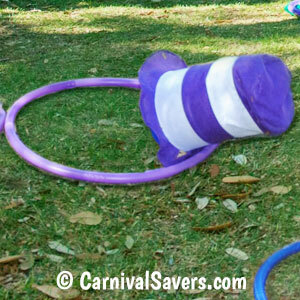 Carnival players use their first hula hoop to toss it over the hat to win the first prize. Note: If they did not hoop the first hat, they can try with the second hoop to ring the first hat. Next, they use their next hula hoop to try to loop the next hat until they are out of hula hoops. When each carnival player is done, they receive prizes for each hat that was hooped! Kids of all ages LOVE this game! We have found they are so tempted to inch forward to try to win at this game - so you may need to remind them to stay behind the line! Of course, your top prize will be won by looping the hat that is furthest away from the players. 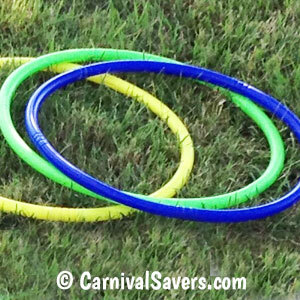 Don't be surprised if children use all 4 hula hoops to try to win the top prize in this game! SUPPLIES & PRIZES Below for the CRAZY HATS CARNIVAL GAME!